Rubellite is a powerful healing tool. It brings energy up from the Solar Plexus to the Heart and beyond to the Throat Chakra. It gently opens, cleanses, calms and ‘lights up’ the Heart Chakra, and acts as an anti-depressant. It can be used to release the emotions attached to an illness or injury, especially if held on or near the affected area. It has a balancing effect on the endocrine system, especially the thyroid. As with green tourmaline, a terminated rubellite crystal makes a fabulous wand. It removes any unwanted (stagnant) energy from the site, then sends healing light into the affected area, without the healer’s active intervention. The deep red variety can be used in psychic development, as it helps to open and cleanse the Third Eye, and is also useful in trance work. 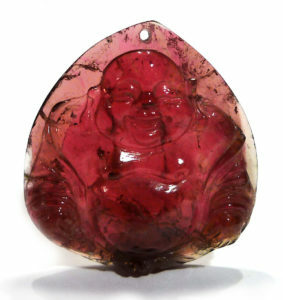 Personally, I wear rubellite directly over my heart when trying to keep my heart open after an unpleasant experience. It helps lighten my mood and reminds me to feel compassion towards others, even those who have hurt me. I also place it directly on the Heart Chakra in treatment, especially when the client is in the final stages of recovery from past abuse or a similar issue. One small word of warning, however: worn for a long period, rubellite can take you so far into compassion that you become highly sensitive to the world’s sadness. Tourmaline is the name for a group of related borosilicates with complex and varied composition. 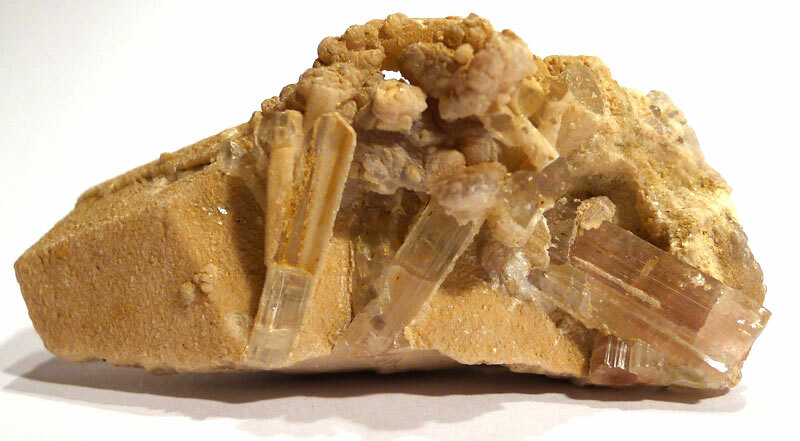 The best crystals are found in pegmatites and metamorphosed limestones which have been in contact with granite magma. Each variety has a slightly different chemical formula. It usually forms long, thin prismatic crystals with a triangular or hexagonal cross-section, frequently coming to a three-pointed termination. Its piezoelectric qualities make it an important mineral in industry, where it is used in pressure devices, such as depth sounding equipment, and in optical devices for polarising light. The general name for the main coloured gemstone variety is elbaite (for the type locality in Elba, Italy). Elbaite displays visible pleochroism (colour changes depending on the direction of view) and strong colour zoning, and may have different colours from one end of the crystal to the other – or, more dramatically, one colour through the centre with an outer coating of an entirely different colour. An example of this latter type is watermelon tourmaline, which has a green outer coating and pink centre. Also common is a black outer coating with a green centre (sometimes referred to as dark green tourmaline). The name rubellite is from the Latin for “reddish”. Up until the 18th century, tourmaline remained unidentified, and was usually confused with other minerals, such as emerald. As a result, much of the lore associated with it also applies to other crystals. However, Theophrastus (c. 371 – c. 287 BC) described a mineral with zoned colouration, which he believed was showing a transition from jasper to emerald – and this was almost certainly tourmaline. The 15th century English story Reynard the Fox (derived from the 11th century Roman de Reynard by John Caxton), describes a ring set with a medicinal stone of three colours, each of which had different properties: red had the qualities ascribed to ruby – the inner fire that brings light into dark places; white was used to treat headaches and eye diseases (this was achieved by stroking the affected area with the stone, or using it to make what we would now refer to as a gem essence); and the green brought love, friendship, and victory in battle. The stone was most likely colour-zoned elbaite tourmaline. According to Bruce G. Knuth, in his book Gems in Myth Legend and Lore, African and Native American tribes, along with some Australian aboriginal groups, use tourmaline as a talisman to protect against all dangers.